Traditional Easter dishes include glazed ham and roast leg of lamb, but if the Easter Bunny stopped by for brunch after a long morning of hiding eggs, he probably wouldn’t want to partake of either. Here, 10 vegetarian dishes to serve guests who side with Mr. Cottontail. 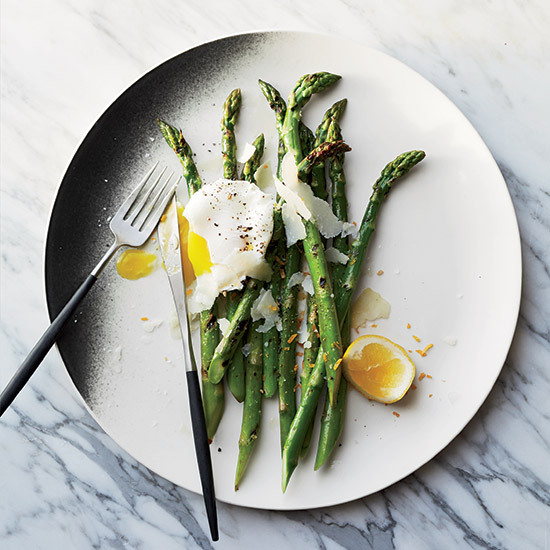 Top Chef winner Nicholas Elmi tops lightly grilled asparagus with perfectly cooked eggs that are poached in Meyer lemon juice and water. This delicate broth is full of vitamin C, thanks to the simmered pea pods. A garnish of white chocolate shards brings out the peas’ sweetness while adding only a little fat. This flaky, buttery tart is filled with fantastic spring vegetables like fava beans, asparagus and scallions. For an easy version of chef Shawn McClain’s terrific spring recipe, we used delicious, tangy jarred artichokes instead of fresh ones. These incredible roasted radishes are warm and crisp-tender, with delightfully bitter greens that are finished with butter and lemon. Cookbook author Georgia Pellegrini purees sweet peas into the batter of her delicate mini pancakes, which are terrific when simply served with herbed yogurt. Luscious, rich and lemony hollandaise gets completely reimagined here in a light, supremely creamy puree of avocado, lemon juice and olive oil. It is delicious drizzled over poached eggs. This vegetarian risotto is enriched with a flavorful broccoli rabe puree that’s stirred in before serving. The combination of flavors here is pure genius. Tarragon is classic with both spinach and eggs, and a touch of sharp feta cheese accents the trio beautifully.